#SajeTip: If this is your first time using any of our diffuser blends, we recommend choosing our Best of Saje Deluxe. This way, you can try six of our best selling essential oil diffuser blends, then select your favourite. 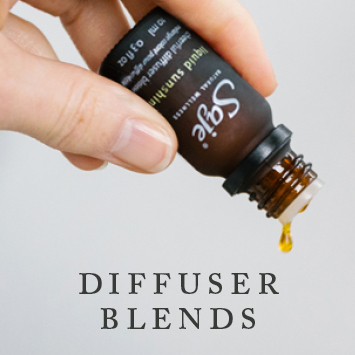 Our diffuser blend collections give you the chance to try a few of our best-selling combinations depending on the mindset you want to achieve. Want to feel at ease? Try our Relaxation Diffuser Blend Collection, a specially curated kit of our favourite soothing and calming blends. Looking to elevate your mood? Diffuse one of our uplifting blends from the Happiness Diffuser Blend Collection. Just add 10-15 drops to your ultrasonic diffuser and breathe it all in.